I've just about got time to enter the November In The Bag Challenge hosted this month by Scott at The Real Epicurean. This month's ingredient is game and I felt like making something with venison. I also felt like eating pasta and so this is the result. A simple enough recipe, but I've got to admit it takes a while to make, especially since you need to put the venison into the marinade the day before. Mix together the marinade ingredients and pour over the venison. Cover and leave in the fridge for 24 hours. When the time's up, drain the venison, reserving the marinade. Pat the venison dry with paper towel. Gently fry the onion and carrot in a little oil for 10 minutes without colouring. Add the pancetta to the pan and continue frying for a few minutes until the fat begins to run. Increase the heat, add the venison and fry for 5 minutes. Pour in the reserved marinade, bring to the boil and let it bubble for a minute or two. Stir in the tomato purée, season with salt and pepper and add the pinch of sugar. Bury the rosemary package among the venison, cover the pan and simmer very gently for 1½ hours, stirring regularly. If the sauce seems to be drying up, then add a little water. Once the meat is very tender, remove it from the sauce and chop it very finely. Discard the rosemary and return the venison to the sauce, which should be nice and thick by now. Make sure the meat is heated through, adjust the seasoning and add a squeeze of lemon. Serve with tagliatelle or some pasta of that sort. As I understand it, the classic lime pickle involves salting limes for some time, preferably leaving them in the sun during the process. Alternative, quicker versions cook the limes. For some reason the version I've developed both salts and cooks the limes. I'm probably just being awkward again. The first stage of salting the limes is broadly the same process that I use for preserved lemons and it may be worth adding a few more limes and some extra salt to the jar to give you some preserved limes for use in other dishes. Preserved limes can be used in a very similar way to preserved lemons but they add a distinctive edge which is all their own. This recipe only makes 1 jar on the principle that a little really does go a long way, but it can easily be scaled up. Wash and dry 4 of the limes and chop them into random smallish pieces. Assuming that the limes are a reasonable size this could be between 6 and 10 pieces per lime. Pack quite tightly into a sterilised jar with the sea salt and add the juice of the fifth lime. Make sure that the lime pieces are covered in salt and juice – they will release more juice after a while in the salt. Seal and label the jar and put away in a cupboard at something like room temperature for at least 4 weeks. Try to remember to check after 24 hours to ensure that the limes really are covered with juice and salt. Add more juice if necessary. After at least 4 weeks remove the limes from the jar and wipe off any excess salt. You're not going to get all the salt off but that's OK because this pickle is meant to be salty. The lime peel will have softened quite a bit by now. Chop the lime pieces into even smaller bits – it's a matter of taste just how small you want them. Toast the black mustard and fennel seeds briefly in a dry frying pan, then bash them up a little in a pestle and mortar. Add the turmeric and chilli flakes to the seeds. Put the limes and sugar into a non-reactive pan and add just enough water to cover them. Bring to the boil, stirring to dissolve the sugar and any salt left on the limes. Add the spicy seed mix and the vinegar and simmer for 5 – 10 minutes until the mixture has thickened somewhat. You should be able to leave a trail through to the bottom of the pan that doesn't instantly close when you drag a wooden spoon through it. Let the mix cool a little before placing into a sterilised jar. I used sea salt from Mornac-sur-Seudre on this occasion. This has absolutely no significance at all – I just wanted to add another picture to this post and, although I could have added a picture of salted limes, I'm afraid they're very dull to look at. Another month and another chocolate challenge. 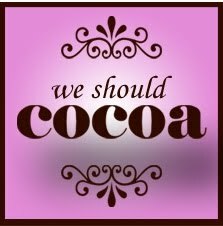 This is my entry in the November “We Should Cocoa” chocolate challenge hosted this month by Chele of Chocolate Teapot. This month the challenge is to combine caramel with chocolate. I had to think about that one for a bit, until I saw some nice looking pears in the supermarket. You need a ripe but quite firm pear for this recipe – if the pear’s too soft it will fall apart completely in the caramel. Friands always feel like a bit of a faff as you melt butter and separate countless eggs but actually they’re really easy and quick once you’ve done the preparation. This recipe will make around 10 – 12 friands, depending on the exact size of the holes in your tin. Of course, you don't have to have a friand tin - a muffin tin will do perfectly well. Friands are a nice shape, though. The caramel in this recipe should end up quite thin, coating the pear without setting too hard. With that in mind, if in any doubt, err on the side of lighter caramel rather than risk burning the sugar. Peel, core and chop the pear into small chunks. Sprinkle these with a little lemon juice and set aside while you make the caramel. Add the caster sugar to a pan and heat it gently until it begins to melt. I follow Delia (we are not worthy) Smith’s advice and only stir after about ¼ of the sugar has melted. From that point on keep stirring and heating but do both gently. At the same time, warm the lemon juice a little. Once the caramel is smooth and a deep amber colour, take the pan off the heat and stir in the lemon juice (be careful – there's likely to be some spitting and bubbling of seriously hot sugar). Keep stirring for a couple of minutes until the caramel has cooled a little, then add the pear and continue to stir for another minute or so. The pear will soften in the hot caramel and should end up thoroughly coated. Set the pear and caramel mix aside to cool completely. Preheat the oven to 180°C. Prepare the friand (or muffin) tin by brushing carefully with melted butter – these cakes have an annoying tendency to stick if you're not thorough with the butter. Sieve the icing sugar, flour and ground almonds and mix them together in a large bowl. Whisk the egg whites briefly just until they're frothy – you only want to loosen the egg whites, you don't want to whisk them until they're stiff. Gently stir the egg whites into the dry ingredients until they're thoroughly combined, but don't overwork the mixture. Now stir in the melted butter, again until thoroughly combined. Drain any excess caramel from the cooled pear chunks and carefully stir the pear and the chocolate pieces into the mixture. You could reserve some of the pear chunks for sprinkling on the top of the cakes just before putting in the oven if you prefer. Spoon the batter into the tin – each hole needs to be about ¾ full. Bake in the oven for 20 – 25 minutes, until lightly golden and springy to the touch. Allow the friands to cool in the tin for a short while before removing them and transferring to a rack to cool completely. Dust with icing sugar if the mood so takes you. I enjoy the crumbly and buttery style of most polenta or cornmeal cakes but, just for a change, this one is more of a rich fruit loaf. It's a distant cousin of a Northern Italian cake but made the lazy way with a breadmaker. Like a lot of moist fruit cakes, I think this works best as a dessert with cream or something along those lines, but that doesn't stop me eating it with a cup of something warm in the afternoon. The order of the dough ingredients given here is correct for Panasonic breadmakers which add liquids last; other breadmakers reverse this order so it's probably best to follow the manufacturer's advice. Soak the raisins in the rum for at least 30 minutes. Put all the ingredients for the dough into the breadmaker. Select the basic dough program. If your breadmaker adds fruit or nuts automatically, then simply add the soaked raisins and the figs to the hopper and choose the appropriate setting. If not, then you'll need to add them manually at the point the manufacturer recommends. Once the program is complete, pour the dough into a greased 19 cm round cake tin. Ideally the tin should be around 3.5 cm deep, though it isn't critical if it's a little deeper. Cover the cake with lightly oiled clingfilm and leave it somewhere warm to rise for around an hour. At this point, if your tin is 3.5 cm deep then the mixture should pretty much fill it. Carefully brush the top of the dough with the beaten egg and sprinkle over the caster sugar. Bake at 180°C for 25 – 30 minutes until brown on top and a skewer inserted into the middle comes out clean. Cool in the tin for 5 minutes or so and then turn out onto a wire rack to cool completely. There seemed to be a lot of sloes left in the hedgerows this year and since I just couldn't drink any more sloe gin without becoming a nuisance I thought I'd take the opportunity to make a chutney. Sloes add a rich colour and a very sharp fruitiness to chutneys. Since quinces are also in season it seemed a good idea to combine the two things especially since I'd just got hold of some Berzycki quinces. (I had some spare quince which I added to pork braised in perry and that was rather tasty too). As with all chutney recipes, the ingredients are pretty flexible and can be altered to taste. This recipe will make at least 5 standard jars – actually I got 5½. Combine everything in a large, non-reactive pan. Bring to the boil with plenty of stirring. Simmer gently, stirring every so often until the mix looks like chutney – this should takes 2 – 3 hours and could take up to 4 hours if you're really being gentle. I'm always a little unsure how thick a chutney is going to be while it's in the pan, but the rule I use is that when I drag a wooden spoon through the mix it should leave a gap through to the base of the pan and the gap should only close after a brief moment's thought. Although, if it's been cooked for a few hours and looks well mingled, then it's really a matter of taste how thick you make it. The chutney will mature and the flavour will improve after at least a week or two in the jar (though that would never stop me opening one immediately).